Buenos dias a todos! This is going to be my first blog post featuring one of my tasty creations along with the recipe so you can try and make it in your own kitchen. Granted it probably will not turn out as wonderful as mine, but obviously, that’s because I am the Teeny Little Super Chef and you my friends, are not. Still, this is a very simple recipe and even the most inept cooker (no offense Papa) should be able to recreate it at home. Now first off, let’s talk about the lentil. Ahhh the lentil, such an underappreciated legume. For those of you who are vegetarian and vegan, you are more than likely familiar with the lentil as it contains a substantial amount of protein. In fact, one single cup of cooked lentils provides almost 18 grams of protein! That’s almost the same as a small chicken breast. And with only one gram of fat and 15 grams of fiber, the lentil is an ideal choice for those trying to get filled up, without filling out. (Quick disclaimer: If you are not used to eating this much fiber in one sitting, maybe take it easy on lentils and start out with about a half cup serving at first. That is, of course, unless you don’t like your familia and esposo or they have completely lost their ability to smell flatulence. Trust me on this one. I am a dog, and I’ve even been offended.) So back to the lentil– not only is it a nutritonal powerhouse, but it is also very cheap to buy and super easy to cook. If you are still not completely sold on the idea of lentils, then maybe my recipe for Lentil Chili will entice you to give it a try. 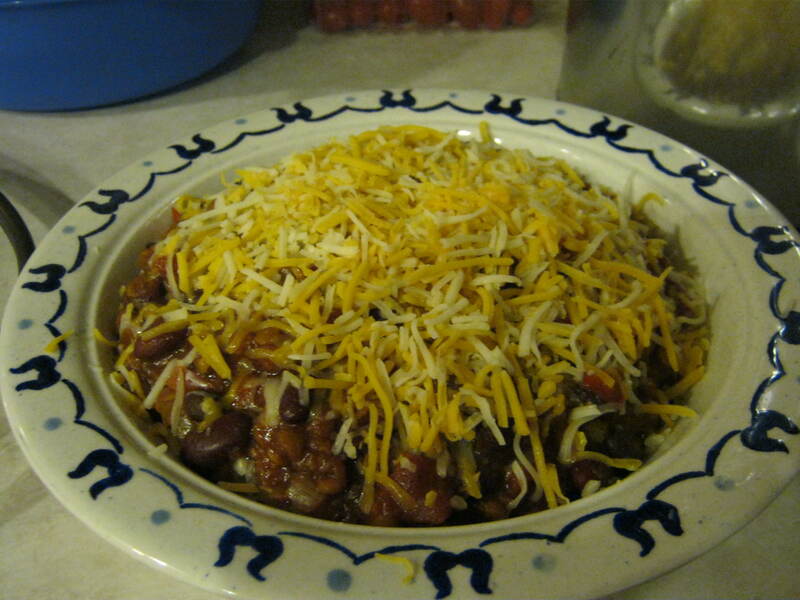 1) Combine all ingredients (except beans and tomato paste) in a slow cooker. Stir to combine. 2) Place lid on top and set to low heat. 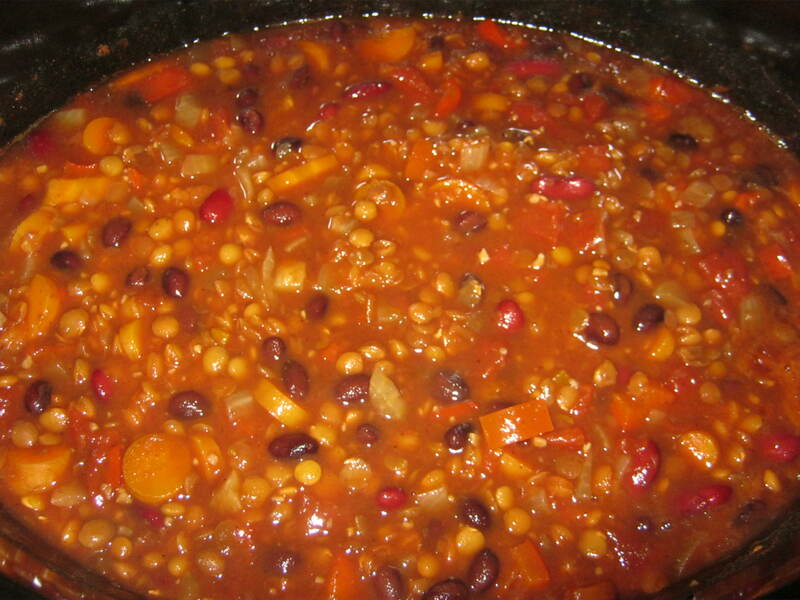 Allow to cook 7 hours or until lentils are tender. 3) Add beans and tomato paste and stir to combine. Put lid back on and allow to cook another 30 minutes. 4) Remove lid, and serve atop a bed of cooked brown rice. Top with cheese, sour cream, chives etc. Enjoy! And that, my friends, is how you make a delectable lentil dish that will please vegetarians and meat-eaters alike. 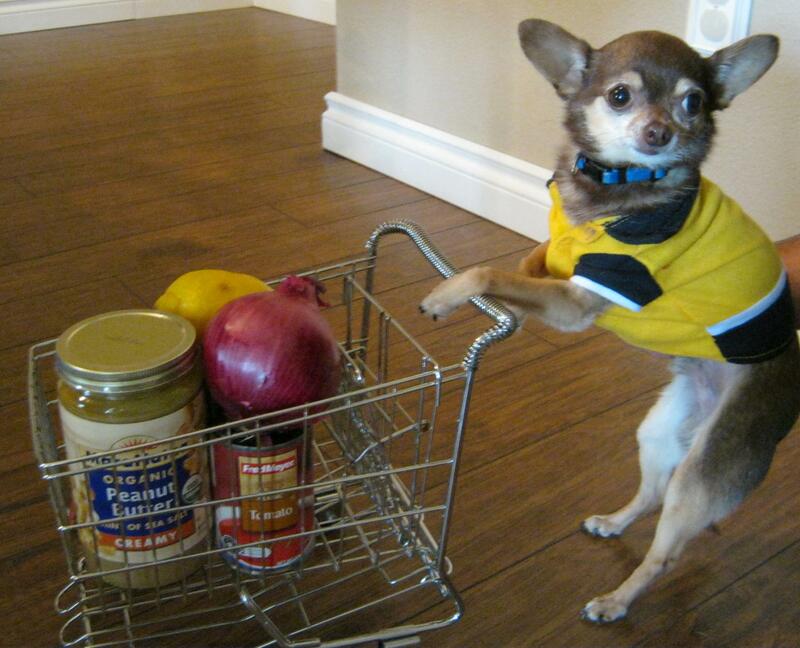 Now if you will excuse me, I must go grocery shopping for my next culinary masterpiece. Adios! Besides cute, the dog has a terrific sense of humor. My head has come off from laughing. I’m enjoying reading about the healthy food from such a cutelittleshopper. The Teeny Little Super Chef is a culinary genius! When I slow-cook the lentils, can I really just leave them alone for 7 hours or do I need to do something (such as stirring) during that time? Thanks everyone for your lovely comments. In response to your question, J, yes you really can just leave them for 7 hours without having to stir. That’s the beauty of the slow cooker. Dump stuff in and it magically becomes a meal by the time you’re ready to eat. Didn’t your wife ever tell you that?? Just had Lentils the other night in my burrito, can’t wait to try this recipe.